Kevin Spacey is producing a new project in town, Manifesto (MAN). The Discovery Channel series will air in anthology format (think True Detective or American Horror Story), and each season will follow how the FBI managed to catch a prolific criminal. The first season is set to focus on Ted Kaczynski, aka the Unibomber. Sam Worthington will play FBI agent Jim Fitzgerald and Paul Bettany has been cast as Kacynski. We first saw signs for MAN between March 8 and 10 on the corner of Hammond Drive and Ashford Dunwoody Road in Sandy Springs. After that, crews worked near Kirkwood, with signs spotted on Hosea L Williams Drive and Howard Street. Between March 16 and 17, crews shot near Mercer University’s Atlanta campus. Also on the 17th, they filmed a scene in the AJC‘s printing press room in Gwinnett County. 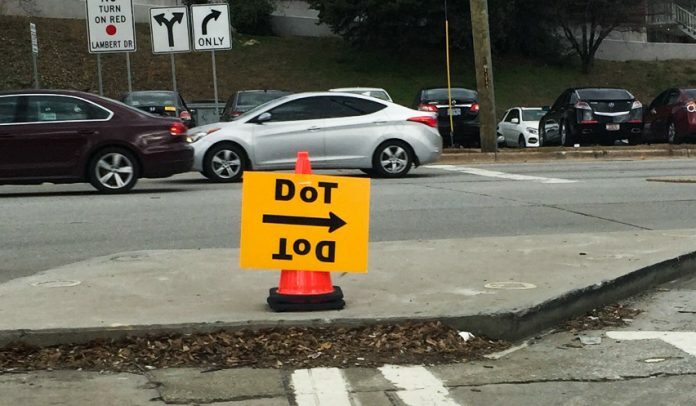 Most recently, filming has taken place in Douglasville. Bank heist thriller Den of Thieves (DoT), starring Gerard Butler, Pablo Schreiber, O’Shea Jackson Jr., and 50 Cent, continued to film this month. Crews started March near the Porsche U.S. headquarters. Signs were plopped on Exit 254 of I-75 on March 6. The next day, filming moved to Buckhead, shooting between The Ivy and Johnny’s Hideaway. Starting on the 11th, a large basecamp was set up in Adair Park. The production has been creating a small headache for local residents there, as Murphy Avenue has been completely shut down between Ralph David Abernathy Boulevard and Northside Drive for the past two weeks. A new production, Fam-i-ly (FAMILY), tells the tale of an emotionally stunted aunt and her 13-year-old niece, who desperately wants to run away and become a Juggalo—yes, as in the Insane Clown Posse. The indie comedy, starring Jillian Bell and Taylor Schilling, began production late last month. In late February, crews filmed in historic Roswell. Between March 10 and 12, production moved to Decatur. Ever since then, this one’s been down in Douglasville. Although it’s winding down, Pitch Perfect 3 (FRANCE) continued shooting in March. They closed out February in Marietta, shooting near the Square. Crews returned to the area between March 18 and 21, with signs spotted near the Big Chicken. Look for more on this film next month, but the sequel to Escape Plan, aptly named Escape Plan 2 (EP2) has started production. Although he starred in the original, there’s no word on whether or not Arnold Schwarzenegger will reprise his role. But Sylvester Stallone, also in the first film, will be part of the sequel. Joining him are Dave Bautista, 50 Cent, and Jaime King. A new Netflix original film, Candy Jar (CJ) joins the scene this month. Although plot details are sketchy, we do know the film will star Helen Hunt, Uzo Aruba, Christina Hendricks, Tom Bergeron, and Jacob Lattimore. On March 8, crews worked in Chamblee Plaza. On the 11th, they shot in both in Piedmont Park and at Oglethorpe University. For the past week, production has been working out of Newnan. In other filming sightings, MacGyver (EYE) was spotted in Stockbridge on the 11th, and at Gwinnet County Airport on March 21. Marvel’s Black Panther (ML) has been mostly at Atlanta Filmworks Studio. Stranger Things (BRIDE) shot near Emory’s Briarcliff campus on March 9, and had a basecamp at Sandy Creek Baptist Church in Fayetteville on the 17th. I, Tonya (IT) filmed at Marietta Square and at the Golden Buddha restaurant off of Clairmont Road in late February. Survivor’s Remorse (SRS4) continued filming its fourth season, appearing near Turner Field on February 28 and in North Druid Hills on March 9. Lastly this month, pilot season has begun. We’re starting to see signs of life in at least two new shows for the CW, Insatiable and Valor. Insatiable, which stars Dallas Roberts, Debby Ryan, and Alyssa Milano, is about a lawyer-turned-beauty pageant coach who takes on a troubled, vengeful teen as his client. Valor is a drama focusing on the military and home life of a unit of helicopter pilots tasked with top-secret missions. We’ll have more details, including location sightings, next month.